Get To Know Astrid Menks – Warren Buffet’s Wife, What is Her Net Worth? The likes of business magnate and billionaire investor Warren Buffet can never be forgotten because of his unparalleled contributions to the business world. There is also one part of him that is also as popular as his business stints and that happens to be his unusual relationship with Astrid Menks. Warren and Astrid have been together for more than 40 years; nevertheless, they didn’t tie the knot until 2006. Warren Buffet is among great and most successful businessmen in the world; he is the owner and CEO of the Multinational conglomerate company, Berkshire Hathaway. Amazingly, he is renowned for being the world’s third wealthiest man with his financial value placed at $84.9 billion. While Buffet has continued to make waves in America’s business sector, little or less is known about his wife, Astrid Menks. 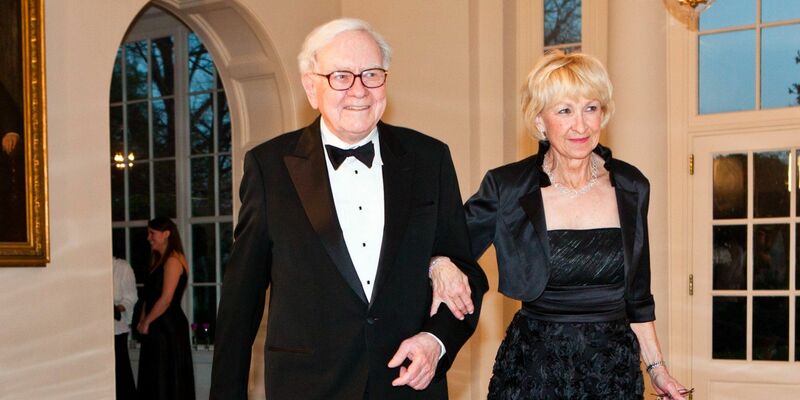 Continue reading as we explore everything you need to know about Warren Buffet’s wife. Astrid Menks is an American celebrity and philanthropist famously known for being the second wife of the billionaire businessman, Warren Buffet. The gorgeous lady first came into this world in 1946 and was born to Latvian parents. Menks is very discreet when it comes to her personal life; hence, she hasn’t shared much personal information including her exact birth date with the media. Similarly, she has never shared other details including her early life, parents, family, and educational background with the media. As the story goes, she migrated to the United States at a very young age in search of greener pastures. When she got to the US, Menks settled in Omaha, Nebraska. There, she was able to take up menial jobs. She reportedly worked as a waitress at a night club called French café in the ‘70s. While there, the young Menks met Susan Thompson, Buffet’s first wife, who happens to be a singer at the same club. After their first meeting, it didn’t take time before they became friends and Susan also introduced her to Buffet on one occasion. Interestingly, when Susan’s career started having an upshoot in 1977, the singer decided to move to San Francisco in search of a larger audience. As a result, leaving her husband and three children under the trust of Astrid Menks and her other friends. After Thompson left Nebraska, things started going well between Buffet and Menks and at some point, she had to move in with him. Although they never got divorced; Susan supported the move and the trio lived together happily for several years void of any issues. During celebrations, these three would send out cards which they all signed together. This continued for several years until Thompson’s death in 2004. After the death of his first wife, Warren Buffet continued with his unconventional relationship with Astrid Menks. Two years later, the pair decided to seal their love by tying the knot. In 2006, they had their wedding ceremony in Nebraska and it was graced by their children and close friends. The news of their wedding circulated through the whole of America and beyond and also dominated the media for long. Since their marriage, the couple has continued to live happily ever after and there has not been any negative news or sign of divorce between them. Astrid Menks and Warren Buffet didn’t have any kids from their lifelong relationship. Meanwhile, the business guru had three children with his late wife, Susan Thompson. Their first child, a daughter named Susan Buffet was born on 30th July 1953; the following year, her brother, Howard, was born on 16th December 1954. Three years later, the couple had another son named Peter Buffet, who was born on the 4th of May 1958. Just like their father, the three children are also successful in their chosen careers. The best part is that they all grew to know love and cherish their stepmom, Astrid, even before she married their father. Till date, Astrid Menks has been a part of several charitable causes and has been a prominent figure in her husband’s business empire. Astrid Menks is undoubtedly enjoying a life of luxury, all thanks to her union with the world’s third richest man. While information regarding her career is not known, there is also no news about her finances. Due to her low-key kind of lifestyle, she has shielded details of her private life from the prying eyes of the media. Her net worth is still under review; albeit, her husband has a gigantic net worth of $84.9 billion as of 2019.